The article below appeared in the HAMPSHIRE LIFE section of the DAILY HAMPSHIRE GAZETTE, a Northampton, MA daily newspaper on May 11, 2001. My thanks to Margot Cleary, Associate Editor for her help in placing my thoughts in some kind of orderly fashion and also to tone down my original manuscript so readers unfamiliar with the bird world would not be seriously offended. In the past few years, I’ve seen a big increase in the number of nesting boxes in the Pioneer Valley. My guess is that most people erect these bird dwellings in the hope of attracting the beautiful Eastern Bluebird. Chickadees, Tufted Titmice and Tree Swallows, which will help put a dent in the flying insect population, are also desirable tenants. It’s encouraging to see more birdhouses out there. But it turns out that a large number of these new nest boxes are being used by House Sparrows - the worst kind of troublemakers. The House Sparrow, Passer domesticus (also known as the English Sparrow), is actually not a sparrow at all but a weaver finch introduced to this country from Europe in the mid-1800s. The male is easily identified by its black throat and chest, which makes him appear as if he is wearing a bib. The female is much harder to discern and can easily be confused with fox, song and field sparrows, to name only a few. Unlike predatory birds such as hawks which are part of the food chain, House Sparrows will work relentlessly to destroy other birds’ eggs and young - for no apparent reason other than their determination to take over the bird world. They do not kill for food. I’ve often come across nesting boxes where House Sparrows killed adult Bluebirds and Tree Swallows as they sat on their eggs. Then they’d begin building a nest right on top of them! In the past, the English Sparrow preferred urban areas. But sparrow problems have recently been increasing in more rural spots. Nesting boxes may be one reason. Well-intentioned people hoping to attract native cavity-nesting birds may actually be doing greater harm by not monitoring their boxes regularly, allowing House Sparrows to proliferate at an alarming rate. Along a route I frequent in the Hilltowns, one house has at least a dozen birdhouses neatly lined up along the driveway. Unfortunately, all of these boxes are occupied by House Sparrows. The people who live there probably believe they are doing a good deed, giving the birds a safe haven to raise their young. Instead, they have created a House Sparrow factory, much to the detriment of native songbirds. House Sparrows can easily produce three to five broods per season. As if that is not enough, male sparrows will mate with several females. With three to five eggs in the average clutch, a single pair of house sparrows can quickly become a flock of 15 to 25 birds in one season, at a single nesting site. 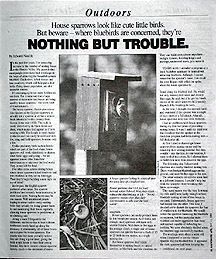 But House Sparrows don’t limit themselves to nesting boxes or natural cavities, as Bluebirds and Tree Swallows do. They can build nests almost anywhere - on light fixtures, building ledges and awnings, under roof eaves, you name it. Years ago, I attended a program at a local Audubon sanctuary to learn about attracting Bluebirds. Although I cannot remember the speaker’s name, I do recall the utter disgust with which he spoke about the House Sparrows he found along his bluebird trail. He would not only remove their nests and destroy their eggs, he said, but if he got his hands on one of the adult sparrows he’d quickly dispatch it by breaking its neck. At the time, I thought this seemed a little harsh and wondered if the speaker was a couple of eggs short of a full clutch. After all, House Sparrows were cute little birds too. I had no problems with House Sparrows during my first two years of providing nesting boxes. It wasn’t until my third year that I realized that the speaker at the Audubon program had been dealing with a full deck after all. At first I tried to discourage House Sparrows from nesting on my trail by removing their nesting material. But they wouldn’t take the hint. At one location, I soon tired of this chore, so I allowed them to build their nest, then removed the eggs. The following day, I discovered sparrows at a nearby Bluebird nesting box. There were broken bluebird eggs on the ground, and more broken eggs in the nest. This same scenario occurred a week later at a different location. I couldn’t help but think the sparrows were wreaking this havoc as revenge. That same season was the very first time my wife and I were lucky enough to have bluebirds nesting at one of two boxes in our yard. Unfortunately, House Sparrows had moved into the other. This time, I decided no to disturb the sparrows for fear of retaliation to the bluebirds. We would notice the sparrows harassing the bluebirds on occasion, but this particular male bluebird was more aggressive than most and seemed capable of defending his territory. We were absolutely thrilled when the bluebird eggs successfully hatched. The nestlings were about a week old when I happened to see the female sparrow exit the bluebird box. It appeared the male sparrow had been keeping the adult bluebirds busy while the female sparrow sneaked into their box. To my dismay, I found all five bluebird nestlings had been killed, each with a single beak blow to the head. This was my turning point. There was no logical explanation for this action, as the sparrows had their own undisturbed nest. 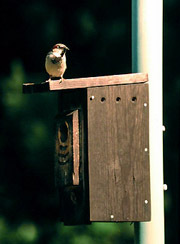 Some traps are designed to be placed inside nesting boxes and will close off the entrance hole after a bird enters. These are nondiscriminatory - meaning that any bird can be trapped by them - and should only be used under close supervision. This type of trap will not harm the bird but if left unattended for more than an hour, desirable birds may enter and then perish from the stress of being trapped. Live trapping and relocation of sparrows is not recommended, as this will only move the problem to another area. House Sparrows and Starlings are introduced, non-native species and are not protected by law. Starlings can easily be controlled by simply using 1 1/2” entrance holes, which they cannot fit through. Until a House Sparrow-proof nesting box can be designed that Bluebirds and Tree Swallows will readily accept, the best workable solution appears to be the elimination of the male sparrow, which makes an attachment to the nest site. This may be difficult for some people to understand until they have had firsthand experience working a Bluebird trail and have seen the destruction caused by House Sparrows. If you are still uncertain at that point, then for the sake of our native songbirds it may be best to take down the nesting boxes and go back to gardening. If left unmanaged, House Sparrows will undoubtedly win the battles for nesting sites. So I am sounding the alarm to anyone with birdhouses: Please help prevent the House Sparrow population from continuing to grow.